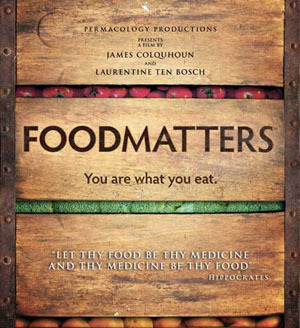 I heard a great story while watching the documentary film Food Matters, directed by James Colquhoun and Laurentine ten Bosch. I want to share this story because it highlights the essence of the movie - the importance of nutrition for optimal health and the apparent conspiracy by the medical community not to practice the adage, “Let food be thy medicine and thy medicine be thy food,” as Hippocrates is so famous for stating in 400 B.C. It seems that the founder of Alcoholics Anonymous, fondly known as Bill W., suffered from severe depression. As the story goes, he had become friends with one Dr. Abram Hoffer, MD, who recommended that Bill take niacin or vitamin B3 at a dosage of 3,000 mg per day. Daily consumption of this dosage of B3 correlated with the end of Bill W’s depression. Yes, even though Bill W. had been “working” the profoundly useful spiritual, emotional, and relational tools of “the Big Book,” he believes that by taking a nutritional supplement he optimized his recovery, ridding himself of severe depression. Bill then suggested to other people who were alcoholic, “Why don’t you try taking niacin?” Niacin reportedly also relieved the depression of the majority of the people who took 3,000 mg daily. Bill W. wanted to incorporate this nutritional therapy into the precepts of Alcoholics Anonymous. This didn’t happen, reportedly because the AA International Headquarters rejected the idea due to Bill W. not being a qualified medical doctor. As a recovering alcoholic who relied heavily on the wisdom and support of daily AA meetings beginning 22 years ago, who deeply struggled with depression those first years of my recovery, and who worked “the steps” with a discipline fit to saving my life, I found the cultural dietary habits of the AA community appalling: coffee and plate after plate of sugary treats offered at every AA meeting, dinners at cheap restaurants consisting of fat, airy pancakes laden with fake maple syrup and more coffee, and breakfasts of Dunkin Donuts and even more coffee. Even though my favorite snack was Peanut M&Ms and Diet Mt. Dew, I would have DEEPLY appreciated some nutritional advice that would have enhanced my 12-step work!